ON 29 SEPTEMBER 1987 the then Treasurer, Paul Keating, announced that up 50% of all new developments could be sold to foreign buyers. At that time, foreign buyers had a $600,000 restriction on them and they could buy old or new properties. The law changed at that time to restrict them to only buying brand new. This rule greatly helped the Australian property market. By allowing 50% of any development to be sold to foreign investors, it opened the door to providing rental accommodation for Australians as foreign buyers could only purchase new apartments, and it protected houses for Australians as old homes could not be bought. In addition, this rule helped ensure standards of development were met, as developers of apartments had to sell at least 50% locally, ensuring they designed apartments to suit the local Australian market. This seemed to be the “perfect” scenario, protecting standards of apartments, mostly stopping poor quality developments, limiting foreign investment without having to tinker with Foreign Investors Taxes or lending guidelines. This worked very well for over decade. Then on 18 December 2008, this 50% rule was abolished, allowing developers to sell 100% to foreign investors. This change was probably the main reason foreign developers entered Australia, mainland chinese buyers started buying up big, and pockets of oversupply and poor quality, tiny apartments, designed to be sold into China started to appear, many with a lack of quality outlook, extending to poor natural light and ventilation due to bedrooms requiring borrowed light from other rooms or in some instances narrow light-wells, low ceiling heights and bulkheads, lack of storage space, etc. Some used poor quality materials, had little insulative properties and no airflow. Some of these projects done especially by some overseas developers cut corners and used cheap materials in construction. Then on 9 MAY 2017, THE 50% rule was re-enacted. In addition, the individual foreign investor will not be required to seek their own foreign investment approval to purchase a new dwelling in an approved development, saving the foreign buyer A$5,000. 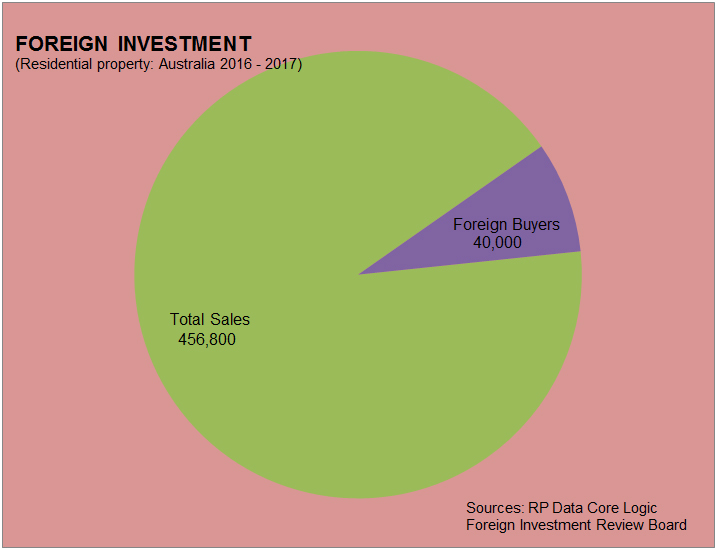 How many foreign buyers are there in Australia? DO YOU KNOW WHAT HAPPENED AFTER THE 1987 ANNOUNCEMENT? Back in 1987, on 29 September, after the dramatic announcement about Foreign investors buying in Australia, restricting them to no more than 50% of a project there was a far reaching impact on the market in Australia, and particularly for apartment quality and values. Supply dropped. Better quality apartments appeared. Only better quality projects appeared.